Install your bulbs, connect the Philips Hue bridge and configure the system using the Philips Hue app for iOS or Android. The names you give your bulbs will eventually copy over to Harmony. Using the Philips Hue mobile app, select MENU > Log in to My Hue. You can sign in to an existing Philips Hue account or create a new one. You may also access your account at my.meethue.com. 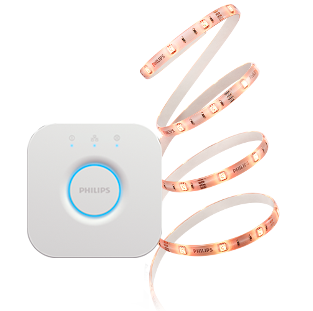 Harmony will now be able to find and control your Philips wireless lighting system. 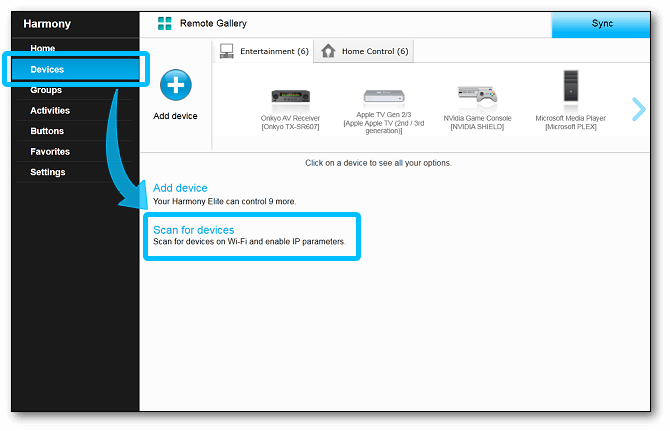 View the instructions below to connect Philips with a new or existing Harmony setup. We recommend using the Harmony mobile app for setup and configuration as it allows greater customization than the MyHarmony desktop software. Select MENU > Harmony Setup > Add/Edit Devices & Activities > DEVICES. 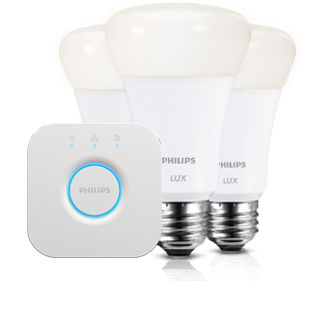 Select HOME CONTROL, then PHILIPS HUE and Harmony will search for a Philips bridge on your home network. Once found, you'll be instructed to press the center pairing button on your Philips bridge. Select the Philips lights you'd like to control with Harmony, then tap IMPORT and enter your Philips Hue account credentials. Once added, Harmony allows you to associate light colors, temperatures or brightness levels to the starting or stopping of your Activities. View the customize section below for more information. Select the Devices tab on the left side of the screen, then the Scan for devices link near the center of the page. Harmony will scan your home network for a Philips bridge, select the Philips lights you'd like to control with Harmony. Once added, Harmony allows you to associate light colors, temperatures or brightness levels to the starting or stopping of your Activities; however, this additional configuration may only be done from the Harmony mobile app. View the customize section below for more information. Using your Harmony touchscreen remote, tap the DEVICES button located just under the touchscreen display, this will allow you to view your devices. Tapping the icon next to the Lights group will toggle all lights on or off, while tapping > to the right of the group name will reveal each of your individual bulbs. Tap > to the right of one of your bulbs, then swipe left or right to control brightness. Bulb colors may only be changed using the Harmony mobile app. Using the Harmony mobile app, navigate to the Devices tab. Tapping the icon next to the Lights group will toggle all lights on or off, and pressing the down arrow will reveal each of your individual bulbs. Long press on the name of one of your bulbs then swipe left or right to control brightness. Select the Scenes icon next to your bulb group. Select the > arrow next to a bulb to view and change its color values. If this bulb only supports brightness control, you'll see a brightness slider instead. You may organize your light bulbs into groups such as Living Room or Hallway. From the Devices tab, scroll to the bottom and select Edit > Group. You'll be prompted to provide a group name and select the light bulbs you'd like to include. Once configured, you may tap the group bulb icon to power everything on/off, long press and swipe left/right to control brightness, or expand the group to control bulbs individually. You cannot change the color for a group of bulbs. If you have a touchscreen remote, the same groups will appear there as well. 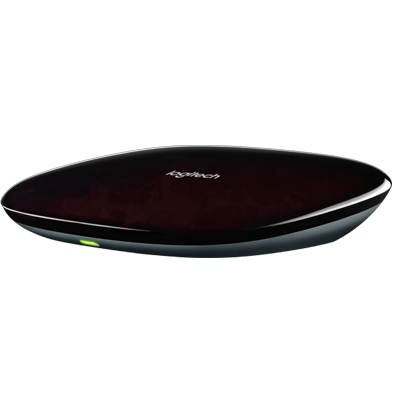 Using the MyHarmony desktop software, you’re able to assign physical buttons on your remote to control Scenes. Short press the assigned button to launch your Scene, or long press the button to turn off all devices associated with your Scene. 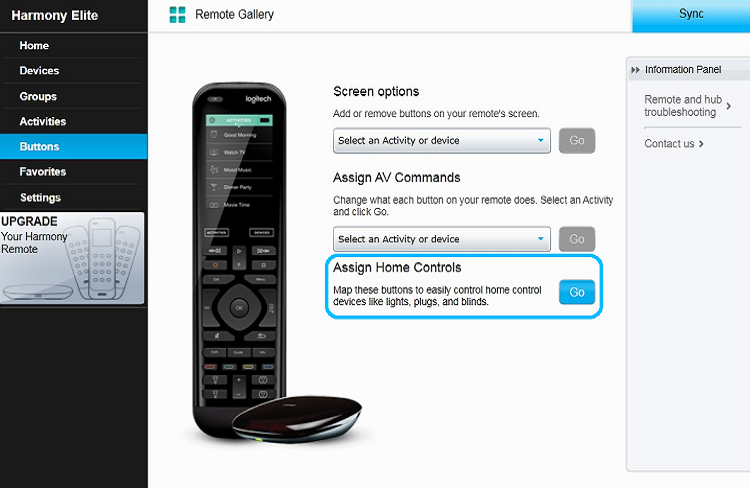 Mapping scenes to the Home Control buttons on Harmony Companion remotes is not supported. 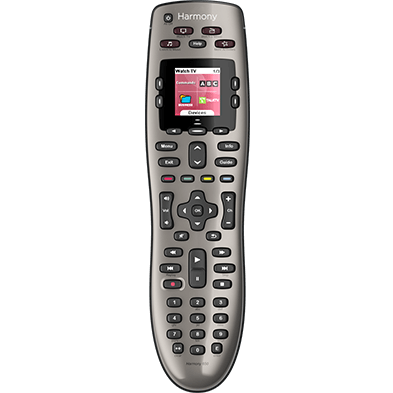 Select your Harmony remote from the gallery. 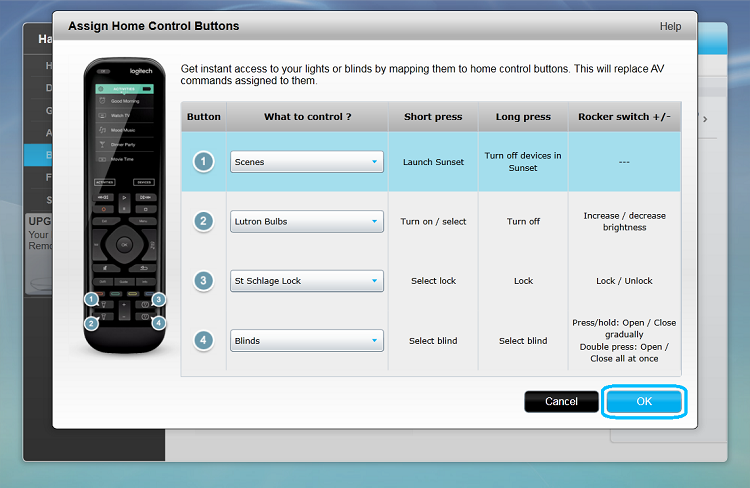 Click the Go button next to the "Assign Home Controls" section. On the next screen, you’ll notice four buttons to choose from. Select the button you wish to assign to your Scene. Under “What to control?”, select “Scene” from the dropdown box ank click OK. The next screen presents you with your current Scenes, select one to assign and click OK.
Next, you’re able to view your current configuration. Click OK.
Congratulations, your Scene has been mapped. Don’t forget to sync your remote after making any changes. It's game time! Let's create an Activity that powers on your TV, AVR speakers, tunes to the sports station, and then turns your lights orange and green in support for your favorite team. Select the WATCH TV Activity type and name your Activity: WATCH SPORTS. Check the devices you need as part of this Activity such as your TV, AVR and cable box or DVR. Be sure to also select the lights you'd like to control. Follow the prompts in the mobile app to configure your inputs. 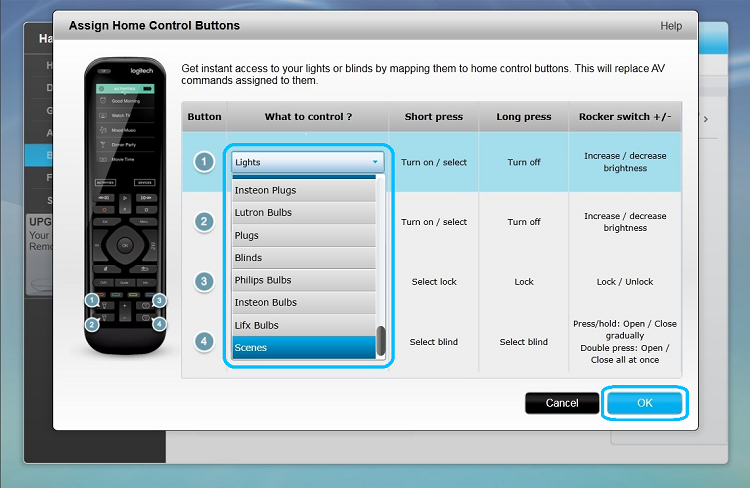 After selecting inputs, you'll be promoted to adjust your home control devices. Click the > next button. Select the > arrow beside your first light and select one of your team colors. Be sure to also set the brightness and ensure the power button is enabled. Repeat this step for each of your lights. Select the > next button in the upper right corner. You can optionally choose to power off or change bulb colors each time this Activity ends. Once complete, you'll see a list of your Activities. Select your WATCH SPORTS Activity. Select START SEQUENCE, then the EDIT START SEQUENCE button. Select ADD A STEP, then click the DEVICE button and choose your cable box or DVR. Enter your favorite sports station number, then tap the > arrow in the upper right corner twice. Keep pressing the > next button until you exit the settings menu. From the Activities tab, select your WATCH SPORTS Activity to see it in action! Have Harmony create a relaxing atmosphere where you can dim the lights and listen to your favorite tunes. Select the LISTEN TO MUSIC Activity type and name your Activity: RELAXATION TIME. Check the devices you need as part of this Activity such as your home stereo. Be sure to also select the lights you'd like to control. Select the > arrow beside your first light and select a relaxing color of your choice. Be sure to also set the brightness and ensure the power button is enabled. Repeat this step for each of your lights. Once complete, you'll see a list of your Activities. Select your RELAXATION TIME Activity. Select ADD A STEP, then click the DEVICE button and choose your stereo. Enter your favorite radio station number, then tap the > arrow in the upper right corner twice. From the Activities tab, select your RELAXATION TIME Activity to begin. Do you wake up for work every day at 7AM? You could create an Activity with sunrise light bulb colors that turn on at that time each weekday. Select the ADD YOUR OWN ACTIVITY type and name your Activity: GOOD MORNING. Select the bedroom light bulbs you'd like to to turn on each morning. Select the > next button and then select either YES or NO as you prefer. We recommend selecting NO, do not power off any running Activities. 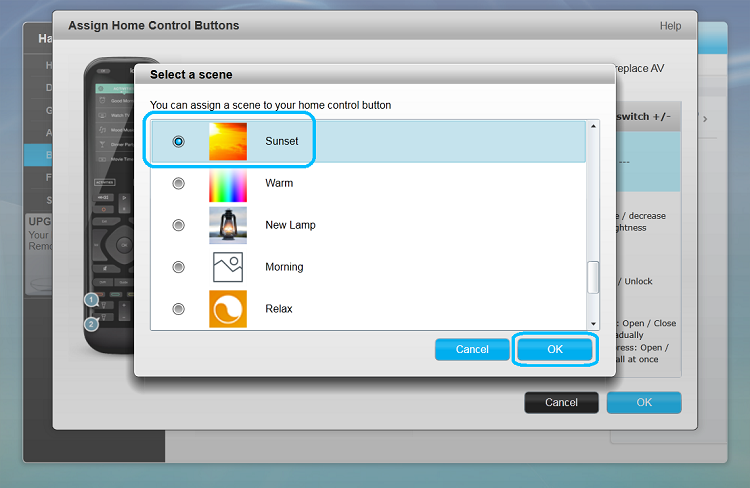 Press the > next button when prompted to adjust your home control devices. Select the > arrow beside your first light and choose a color you'd like to wake up to. Be sure to also set the brightness and ensure the power button is enabled. Repeat this step for each of your lights. Select the > next button in the upper right corner. You can optionally choose to power off or change bulb colors each time this Activity ends. We recommend you select each light bulb and power it off. Press the > next button until you see your list of Activities. Select your GOOD MORNING Activity, then select SCHEDULE. Set your start time and select the days you'd like it to run. From the Activities tab, select your GOOD MORNING Activity to manually trigger it, or wait until your pre-set time to see it run. The number and types of unique Activities you can create are endless and dependent on the entertainment and home control devices you have. Do you sometimes eat in the living room? You could create two Watch TV Activities, one with and one without your overhead lights. Need a quick reminder go to the gym every Tuesday and Thursday night? Have Harmony turn off your entertainment system and turn your lights blue on those days to keep yourself motivated. Share or brainstorm your ideas in our online community forums. Can I choose which scenes to import? The top 50 most used scenes from your Philips Hue app (second generation) will be automatically imported and appear within Harmony. If you are still using the first generation Philips Hue app and have synced your scenes with a My Hue account on meethue.com, you may import these scenes by selecting Harmony Setup > Add/Edit Devices & Activities > DEVICES > HUE > IMPORT SCENES FROM MEETHUE.COM. Any changes you make to scenes may be imported by selecting Harmony Setup > Add/Edit Devices & Activities > DEVICES > HUE > REFRESH. Ensure that you are using the second generation Philips Hue app to create scenes. Select Harmony Setup > Add/Edit Devices & Activities > DEVICES > HUE > REFRESH to import any changes that you have made to the scenes. If you are still using the first generation Philips Hue app and have synced your scenes with a My Hue account on meethue.com, you may import these scenes by selecting Harmony Setup > Add/Edit Devices & Activities > DEVICES > HUE > IMPORT SCENES FROM MEETHUE.COM. Will scenes I create/delete automatically be added/removed on Harmony? If you create or delete a scene using the Philips Hue app, you must go to HARMONY SETUP > ADD/EDIT DEVICES > ACTIVITIES > DEVICES, select the Philips Hue device, then press the REFRESH button. 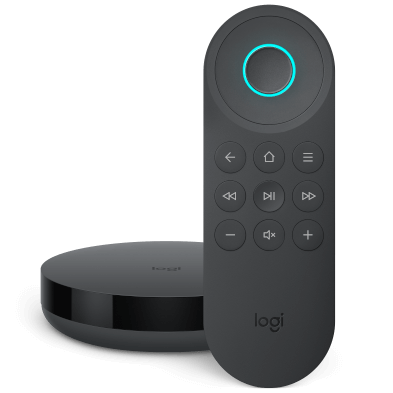 If there is a specific scene you do not want to import to Harmony you must log into your account at meethue.com and locate the scene, then press More details > Edit, and deselect Logitech Harmony. Refresh Philips Hue from within the Harmony app to reflect the changes. Errors do not appear through Harmony’s user interface. If an error has occurred, first check the Philips Hue bridge. Can I use more than one Philips Hue bridge with my Harmony hub? No. Only one Philips Hue bridge per Harmony Hub is supported. Can I re-order the position of scenes within Harmony? Press the Devices tab, then the scenes icon. Scroll to the bottom and select Rearrange Scenes. Press the X in the top right to save. You cannot re-order scenes using your Harmony remote. Harmony connects with your Philips Hue bridge using your home Wi‑Fi network. Please ensure your Philips Hue bridge is connected to the same home network as Harmony. 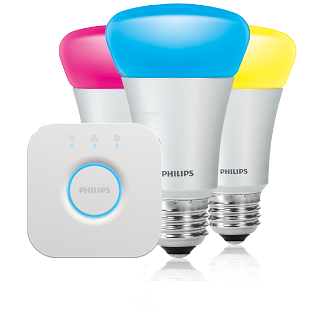 Harmony uses the Philips Hue cloud to import and control your Hue scenes. 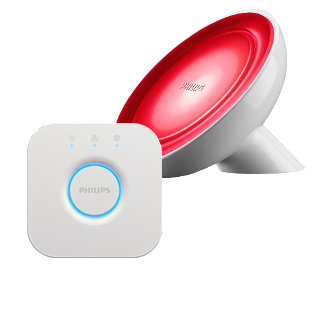 Harmony works with both the original round and the new square shaped Philips hubs.